Retro-Speedway have launched a new series of DVDs featuring the best racing action of the sport's biggest stars of the eighties - Bruce Penhall, Michael Lee, Kenny Carter, Billy Sanders and Kelly Moran. Here we look at "Bruce Penhall Racing", a four hour double-DVD production. This isn't a documentary telling Bruce's story, it's a compilation of many of his best and most important races, with some other interesting bits and pieces thrown in for good measure. The races are shown in chronological order, allowing us to follow his career from its early days to its unforgettable climax just a few years later. A short, sharp and successful career in which the blonde American captured the attention of the speedway world and beyond. The earliest footage comes from a 1976 challenge meeting between the East and the West at Irwindale Speedway in California. We see young Bruce scraping the fence as he takes to the track with the likes of Rick Woods and the Bast brothers. The material available becomes more plentiful when he moves to Europe and the 1979 action includes him racing in the World Team Cup; at Exeter for Cradley; in the Internationale at Wimbledon; the Masters of Speedway at Vojens and in the US qualifiers for the World Championship. The following year sees him racing indoors in the Birmingham NEC; back at Wimbledon for the Spring Classic; appearing in Swindon colours in the Bob Kilby testimonial; racing for the US v England; in action at Cradley Heath in the Golden Hammer and against Coventry Bees and making his World Final debut. Penhall's famous World Final win at Wembley in 1981 is obviously well documented here. Even after all these years the spectacle and atmosphere still raise the hairs on the back of the neck. The racing that night was special and Penhall cemented his place in speedway history by coming out on top. Bruce's appearance at the neighbouring Wembley Arena is also on the DVD, though it's fair to say the spectacle wasn't great and it was speedway in name only. Interesting none the less to see the game's biggest stars pulling a series of controlled broadsides. Other 1981 footage includes a very wet WTC meeting at Reading and a massive Cradley win at Coventry. The 1981 Overseas final is also featured - including Penhall's third bend clash with Kenny Carter, a foreshadowing of events to come. Penhall's called it quits in 1982 and we see him racing for the Heathens at Birmingham; for the USA in a series of test matches against England; in the YTV trophy at Sheffield and in the WTC at King's Lynn. The Overseas Final also features strongly again, with particular focus on heat 19 where he gives up the chance to win the meeting in order to ensure safe passage to the next round for his compatriots. The White City crowd were unforgiving and Bruce himself looks shocked by their reaction. The final meeting of his career was the 1982 World Final staged in his homeland. The events of that night are legendary and covered in detail on the DVD. A nice addendum is a 'World of Sport' follow-up feature that includes 'reverse angle' film of the infamous Carter/Penhall crash, offering a different perspective on that particular incident. And then it was over - both his career and the DVD. The video quality of the archive clips isn't always great but it's all more than watchable. There are a number of interviews with Bruce included, giving the impression of a deep-thinking and intelligent man. 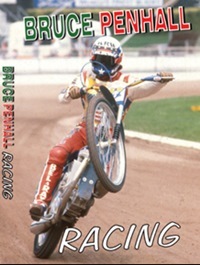 It's unimaginable that any fan of Bruce or Cradley Heath wouldn't want this DVD. It's a time capsule of his career and is snappily edited to ensure it retains your attention throughout.